Dress up her hair with these embroidered ponytail holders available on either a elastic ponytail holder or choose a locking pin back and attach them to the center of any flat knot pony streamer or boutique hair bow. You'll find plenty of different ways to customize your ponytail without the custom prices. A wonderfull way to jazz up that special vacation outfit with our vacation mouse ponytail holder. She will be as sweet as candy with this perfect Ponytail holder. Choose Colors to match her outfit for the perfect PONY'O . 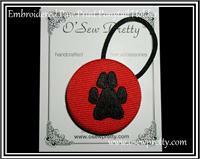 A great Accents for piggy tails too ! Let her be cute as a bug all year long with this perfect PONY'O . A great bow for piggy tails too ! A great option for piggy tails too ! Shown in regal purple with yellow gold embroidered emblem. 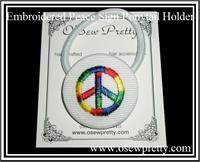 A embroidered Button ponytail holder for Girl scouts. A embroidered Pink Flamingo shown on lemon grass makes this the perfect summer accessorie. A embroidered Ice Skate that you choose the colors to make it a perfect ponytail accent. 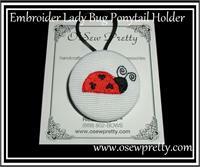 This embroidered crab ponytail holder is available in your choice of colors. A wonderful way to spice up that summer outfit and a great alternative for older girls too. Add a little flair to your little girls hair with a make it to match embroidered tulip button ponytail holder. She be ready for that Halloween Party with this perfect ponytail holder. Along came a a not so scary spider and sat down beside her! She be as cute as a pumpkin with this Halloween pumpkin ponytail holder. 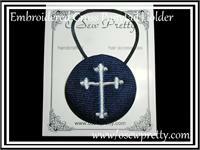 Match her nautical clothing with this embroidered anchor ponytail holder. Match her winter outfits with this embroidered snowman ponytail holder. Match her winter outfits with this embroidered gingerbread man ponytail holder. Treat her this fall with a embroidered fall pumpkin hair bow. A Embroidered Apple Ponytail holder that you choose the colors to make it a perfectly match hair accessorie. Match her winter outfits with this embroidered snowflake covered button ponytail holder . Let her show her love for Christ all year long with this perfect PONY'O . 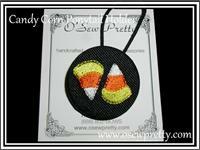 A great accent for piggy tails too ! Show off your school spirit this year with this perfect ponytail holder .